Since Apple’s iPods and iPhones stole the spotlight a few years ago, a huge market has emerged for accessories. While most of these tend to be funky looking cases, cheap chargers, or portable speakers, there are a few unique accessories that will help deal with some frustration Apple’s products cause. For example the latest iPhone 3GS iteration has been known for it’s extremely poor battery life. And if you own an iPod Touch you are well aware that there isn’t a removable battery to swap out when the device runs out of juice. Kensington fortunately offers a simple and viable solution with their new compact Mini Battery Pack and Charger for the iPhone and iPod. As the name suggests, this product is the portable version of Kensington’s larger Battery Pack and Charger for iPhone and iPod. While the larger version offer a more powerful battery, the unit is almost the size of an iPhone and requires a cable to connect to your device, which is a bit messy. On the other hand, the Mini Battery Back is only about one third the size of its counter part and plugs directly into your devices dock connector. It clings on well enough that you can continue to use your device while it’s getting charged. The unit is roughly the width and thickness of an iPhone but is only two inches tall, small enough to slip away into your pocket or purse. An included plastic cap prevents dust from building up on the dock contacts and also doubles as stand. It is supposedly suppose to be able to hold your device upright to watch a movie, but it’s quite flimsy and I wouldn’t count on it. Irrespective of that small quirk, it doesn’t deter from the quality of the rest of the product. 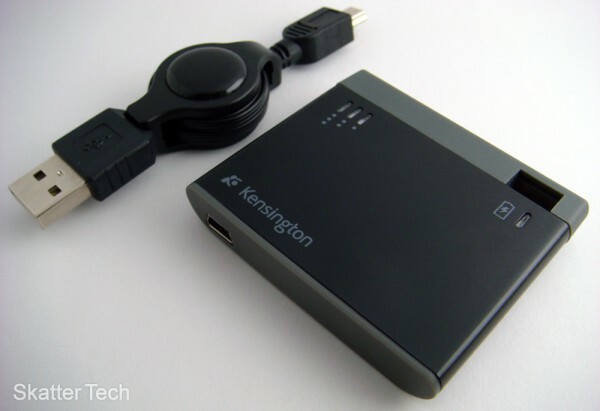 Kensington also includes a USB cable, which winds up itself, for charging the battery pack. 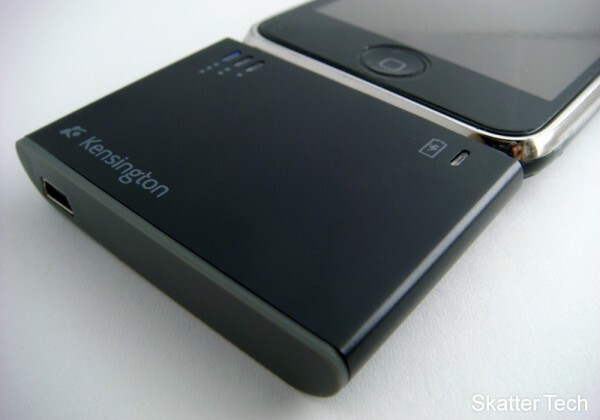 Kensington uses a lithium-ion polymer battery cell in their device. The Mini Battery Pack is compatible with any iPhone, iPod Touch, or iPod with a dock connector. (Except for 3rd generation iPod.) If you are on the go and your device runs out of fuel, the Mini Battery Pack extends run-time for another 30 hours of music, 6 hours of video, or 3 hours of talk time for iPhones. I tested the battery pack by charging my 2nd generation 32GB iPod Touch starting with fully drained batteries. It was able to bring my dead unit back to a full charge with more power left to spare. Plus it impressively took just about the same time it would have taken to charge my device with my computer. An LED indicator displays how much power is left in the Battery Pack. You can charge both the Mini Battery Pack and your iPhone/iPod Touch at the same time using the included USB Cable. There’s one major downside for iPod Touch owners, the location of the headphone jack. Since both the headphone jack and dock connector are on the bottom, you won’t be able to plug your headphones in while charging the device. iPhone users on the other hand are safe from this flaw since the headphone jack is on the top. Either way, that won’t stop you from playing games, browsing the web, or using the tons of available applications while recharging. The Kensington Mini Battery Pack is convenient and compact product, which is great for those who are heavy iPhone or iPod Touch users. It’s also great for road trips or planes when there’s no access to a computer with a USB port for charging. iPhone users will love this as it almost doubles the battery life of their device for tasks such as movie playback. Overall, if you are someone who uses your iPhone enough that it keeps running out of power before the day ends or just travels a lot, this is an excellent solution. It’s available for an affordable price of $32.99 on Amazon.